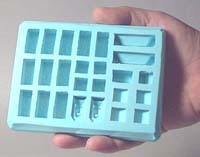 We make and sell silicone rubber molds. These molds are made of the highest quality silicone available and will last for years and hundreds of casts. To see what molds we have available, visit the Molds Available page, or order directly on our Online Shopping Cart. 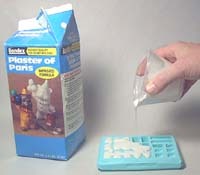 Mix and Pour Plaster into the Mold. Afterward, scrape the top of the mold with a putty knife or ruler. You can find Plaster of Paris in the paint department of any Wal-Mart or hardware store. There are other much stronger casting materials available. For complete casting instructions, and for a list of other casting materials, visit the Casting Instructions page. After 25 Minutes, Pop Out the Blocks. 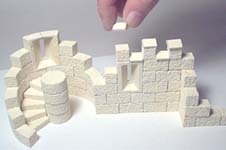 The mold is very flexible and the blocks will come out easily. You won't need to clean the mold because nothing will stick to the moldmaking silicone. You can continue to make additional casts every 25 minutes. Think of the blocks as Legos that you'll never run out of because you can make as many as you want. Since the blocks are textured on all sides (except the side you scraped), you can make a building with stone texture inside and out! Glue the Blocks Together with Wood Glue. Be sure the blocks are completely dry first. Elmer's wood glue works fine, but my favorite glue is "Aleen's Tacky Glue" which you can find in the craft department at Wal-mart. It's usually used to glue cloth. 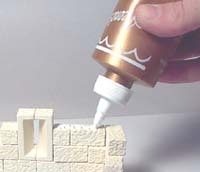 For more information on stacking and gluing, visit our Building instructions page. Paint the Model with Cheap Latex Paint. Exterior latex house paint works the best. You can also use acrylic craft paint that you would find in the craft department of most stores. 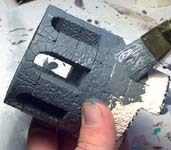 For more information on painting the models, look at the Painting instructions page. We have a large variety of projects you can build, with step-by-step instructions. To see the projects we have instructions for, visit the Projects page. The ruined tower on the left is just one example of what you can build. 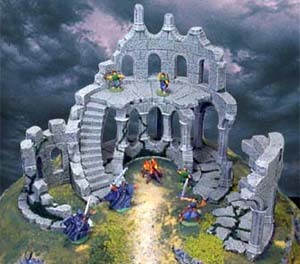 To see instructions for building this project, go to the Ruined Tower Instructions page. To see what other customers have built, visit our Gallery page. Thank You for visiting our quick guide. For complete information on our products and instructions, head back to the Home Page.